﻿ What kind of bait to catch a groundhog? What kind of bait to catch a groundhog? What Is The Best Bait To Catch A Groundhog? - Bait is not important. Trap placement and set is more important. Set the trap on the normal runway between burrow and entrance to your garden, for example, and line the bottom of the trap with grass to make it look natural. If you must use bait, the best bait is fresh vegetables: broccoli, peas, corn, etc. One of the features that you will see in many traps is an area where you can place a bait to try and lure an animal into the trap, and these compartments are just as useful when you are dealing with groundhogs as they are with most other animals. There are many different foods and types of bait that you can use when it comes to catching a groundhog, but it is also worth remembering that there are plenty of other features that can contribute to successfully trapping the animal. As groundhogs naturally scavenge around the area where their burrow is, you will often find garden vegetables or fruits that have been taken, and this can be an indication of the type of bait that could prove successful. The challenge with choosing bait is that animals, like people, will have a preference when it comes to taste, and one food that proves irresistible to one groundhog may not be as successful with another animal. Some of the most successful vegetables that can be used as groundhog bait include peas, lettuce sweetcorn and string beans, while fruits such as cantaloupe, strawberries and beaches are also popular. These should be left in the trap in a position where the animal has to trigger the trap in order to reach the bait. However, while choosing the right bait can help with the success of a particular trap, other factors are even more important in determining whether or not your trap will catch the groundhog. Another option that some people will choose when it comes to getting rid of groundhogs is poison bait, and although it is called a bait it isn't really stored in a trap and is not really a type of bait. These are simply granules of a lethal poison that are sprinkled outside the hole of the groundhog, and as they are designed to appeal to the animal in terms of the scent, many groundhogs will eat them. The problem with poison bait is that you cannot determine where the carcass of the groundhog will be found, and if he finds a location around your home, or within the burrow, you will often be able to smell it but won't be able to remove the carcass, which can draw more pest animals. While bait can help to decide whether or not a groundhog trap is successful, the location of the trap is an even more important part of the trapping process. It is best to locate the trap around six feet away from the entry hole to the burrow, and if you have more than one entry point, installing multiple traps can help to increase the chances of catching the groundhog quickly. It is best to wash down any traps with water to remove any human scent, and if you can cover some of the trap by locating it in a bush or under a low lying tree, this will help to avoid the animal becoming suspicious of the trap. Can You Trap Successfully Without Bait? This is one of the most important facts that you need to know when it comes to trapping a groundhog successfully, as bait is not always a necessary feature in a trap to be successful when it comes to catching the animal. Make sure that you have a sturdy cage trap, as groundhogs have large front teeth which can cut through many thinner wires in a cage, and most of the traps will either be a one or two door trap. The one door traps are the most straightforward for those using traps for the first time, and make sure they are located near the entry hole of the animal. While bait is not essential, along with the other factors it can help to deal with the problem successfully. Trapping is certainly the most common method of dealing with groundhogs, but there are certain other measures that you can take to try and deal with the animals. If the entry hole to the burrow of the groundhog is located near a fence, you could try to create a tunnel over the entrance to the burrow with chicken wire with a one-way funnel at the end of the tunnel to take the animal out of your yard garden, with the funnel preventing the animal from coming back in. The most important feature to help keep groundhogs out of your garden is a good fence, and if the steel mesh is embedded around six inches into the ground, this can help reduce the chances of the groundhog being able to dig under the fence. Go back to the main Groundhog Removal page for more information about what type of bait to use to trap a groundhog. 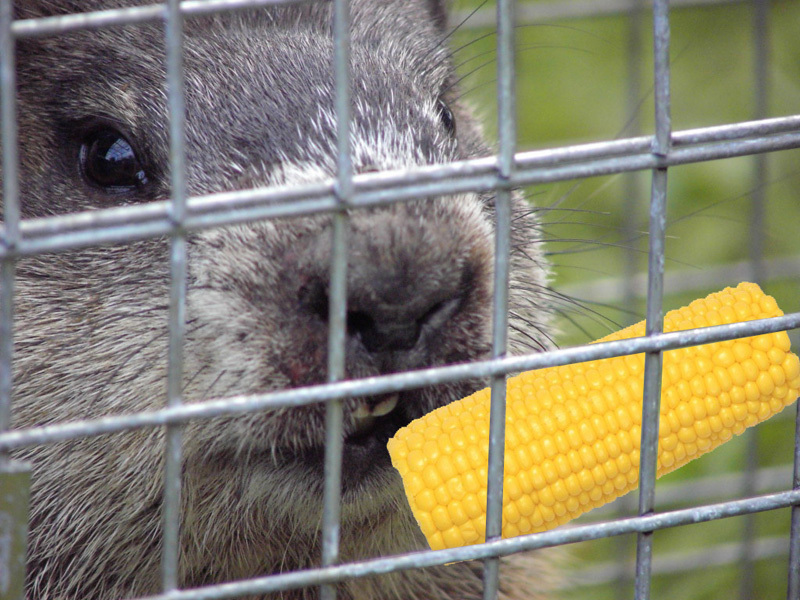 What kind of food do you put in a groundhog trap to catch the animal? What is the best groundhog bait?